If God is Sovereign Then Why Pray? “If God is sovereign, then what is the point of prayer?” It’s an age-old, and understandable, question. Who hasn’t asked this? After all, if God is in complete control of the affairs of history, and perfect in wisdom, what difference do our measly prayers make? Won’t his will come to pass regardless of what we pray? So, why pray? As a result, unfortunately, many don’t. Anytime we face a difficult question like this, it helps to step back and consider precisely what the Bible says. On, the one hand, there are many calls, commands, and invitations for us to pray. It is evident from these invitations that the authors did not see their prayers as meaningless words or wasted time. Rather, they saw prayer as achieving something. Jesus himself encourages us to pray, saying “Ask, and it will be given…” (Mt. 7:7f). There are over 20 references to prayer in the book of Acts (e.g. Acts 1:24; 4:31; 6:6). The Apostle Paul’s letters are filled with prayers (e.g. Col 1:3f; Eph. 3:14-20). Paul also regularly requested prayer, on one occasion saying, “Brothers, pray for us” (1 Thess. 5:25). Likewise, he encourages Jesus’ people to pray “at all times” (Eph. 6:18). James writes, “The prayer of a righteous person has great power…” (James 5:16) and notes that the reason we don’t have certain things is because we haven’t asked for them (James 4:2). Even a cursory reading, of these few passages, indicates that our prayers matter to God. God wants us to pray. God hears our prayers. God answers the prayers of his people, according to his infallible knowledge. At the very same time, the Bible is emphatic that God is sovereign. God’s sovereignty refers to his ability to do anything that is in accordance with his character. In other words, he rules over the entire created order to bring about his pre-appointed purposes—which nothing can stop, not even evil. He does whatever he pleases (Ps. 115:3; Ps. 135:6). He “upholds the universe by the word of his power” (Heb. 1:3) and in him “all things hold together” (Col. 1:17). Even the decision of the dice “is from the Lord.” (Pr. 16:33). He also rules over geo-political affairs, making some nations great, while destroying others (Job 12:23). This is why Jesus can say that all things are possible with God (Mt. 19:26). The overwhelming testimony of the Scripture is that God is sovereign. This is more significant than we tend to recognize. After all, if God is not sovereign, then why pray at all? We shouldn’t. So, what do we do when faced with a biblically clear call to pray and an equally clear revelation of God’s sovereign power? Answer: We accept them both. There is no contradiction or inconsistency here. “But, how does that work?” The answer of pastoral-theologians throughout the history of the church is that God has sovereignly ordained human prayer as a means by which he accomplishes his sovereign purposes. That’s a mouthful, so you may want to read that again. God’s sovereignty doesn’t exclude our prayers, but includes our prayers to bring about his purposes. Let that sink in. God isn’t a fatalistic machine that mindlessly churns out his will. God is more like a skilled sovereign artist, who willfully includes our inferior prayers into his superior purposes. As such, our prayers serve as a means to his ends. Understanding this changes how we pray. Knowledge of God’s sovereign purposes through our prayers brings significant purpose, confidence, and joy to our prayers. God’s sovereign artistry gives our prayers purpose because we trust they are chosen means of achieving his will in the world. God’s sovereign power gives us confidence in prayer because we trust he is more-than-able to bring about all that we ask. God’s sovereign wisdom gives us joy in prayer because we trust he will always do what is best. In God’s economy, our prayers matter—more deeply than we know. P.S. Also, please join us this coming Sunday, October 28th, for DCC’s bi-monthly prayer night. Doors will open at 5:00 pm. We’ll begin our evening of corporate devotion, song, and prayer promptly at 5:30 pm. The good news of Jesus, the gospel, is meant to be delivered (Mt. 28:19-20). The gospel is not a message meant to stay in place for long, let alone relegated to dusty doctrinal statements. The gospel is meant to move and spread, not sit still. By God’s good design, the primary deliverers of this message of Jesus are the people of Jesus. As Apostle Paul said, “How beautiful are the feet of those who preach the good news!” (Rom. 10:15; cf. Isa. 52:7). Those gospel-delivering feet are not beautiful because they are well pedicured, but because the news they carry is of inestimable value. Think of the joy of seeing a young ring bearer deliver the bride’s ring to the groom during a wedding ceremony. All eyes are on him. The deliverer is honored because of the profound significance of his delivery. That delivery points to powerful relational realities and massive joy, hope, and love that flow from them. Now multiply that by eternity and you begin to scratch the surface of what’s at stake in delivering the gospel. That makes for beautiful feet. These beautiful feet carry the gospel into our neighborhoods, condo buildings, grocery stores, cafés, schools, and offices. They make gospel deliveries while having lunch with friends, or riding the metro with a coworker, or talking on the phone with family. Yet, they don’t stop there. The gospel is not content to stay at home. It is a power, the power of God for salvation, that pushes outward (Rom. 1:16); not only among the neighborhoods of our city, but among the nations of the world. Unsurprisingly, Jesus has the same delivery strategy for the nations, as he does our neighborhoods, namely our feet. Beautiful feet lead to glad nations that sing for joy (Ps. 67:4). With God, we want all the ends of the earth to be eternally glad, in Him (Ps. 67:7). Therefore, to help facilitate DCCs part in the global movement of the gospel we are having our first missions meet-up this coming Sunday, October 21st. This is the first of what will be monthly meetings that will explore how we can participate in God’s global purpose to take the gospel to the nations through the reading of books, articles, biographies, and discussion. These meetings are intended for anyone interested in learning more about long-term global missions and catalyzing global church planting. PRAY. Ask the Lord of the harvest to raise up global workers (Mt. 9:38). While you are at it, ask the Lord if you may be among them. We currently have three members training to reach unreached people groups. Lord willing, this is just the beginning. We hope to get to the place where we are able to send ten missionaries a year to help plant churches among unreached nations. JOIN. Join the Global Missions Interest Group on The City here. Join the missions meet-up this Sunday. Consider devoting the next season to prayerfully exploring your role in Jesus’ unfolding global story. PARTNER. Together, our cheerful, sacrificial, and regular giving supports this ongoing spread of the gospel, from our neighborhoods to the nations. DCC gives 10% of all giving received to this work, from funding church plants, to supporting pastors, to training. Even this week, we are hosting an Acts 29 Assessment Conference for six church planting couples. We all play a role. Some of us will be called by God to go. The rest of us are called by God to fund those who do. Who knows what He may do through us? Let’s trust him together. As a result, much of my life has been a quiet tug-of-war, of never quite fitting into the Asian norms or high expectations set by my family, but also feeling like a foreigner to many American mannerisms. Was I supposed to stay silent or speak out? Was I supposed to obey authority or challenge it? To me, it was a dichotomous place of tension I lived in, never really knowing how to reconcile the two cultures from which I learned. Coming to DCC, the disparity of Asian and minority representation in leadership was something I acknowledged but was not unaccustomed to. I grew as a believer in predominantly white churches, but the personhood of Jesus Christ always made me feel so close to Him and His people, despite our ethnic differences. It wasn’t until recently that I felt safe enough to talk about my Asian quirks and heritage to non-Asians here. I attribute this space of comfort to my community, which has taught me so much about God’s acceptance and love far beyond any body of Christ I’ve encountered. I moved from a group of Asian Americans to a community of majority white members. I knew my community cherished me, but there were many times I still felt on the fringes, catching the tail ends of pop culture references and missing punchlines to jokes. Those were the moments I asked myself, can a Christian feel lonely even among Christians? How terrible if this were the permanent reality—of being not only a stranger to this world but also a foreigner among other believers as well? But thankfully, this was not the plan God had for me. After a year of persistently attending community, sharing vulnerably with my discipleship group, and receiving an abundance of generosity from my Christian friends here, I’ve been deeply filled and refined into a godlier woman. When I was overwhelmed and pining desperately to leave Seattle, it was my Scottish-Swedish friend who comforted me when I had no words left to say. When I was flailing for friendship and laughter, it was my German friend who brought me ice cream and took off her make-up alongside me. When my lease ran out of time and I didn’t have a place to stay, it was my Jewish-German friend who immediately offered her place for me to stay. When I was harassed on the street and felt completely helpless, it was my German-English friend who empathized with and comforted me. When I was stressed from the demands of work, it was my German-English friend who gave me perspective and reminded me of the grace of God. When I felt stagnant in my faith, it was my Chinese friend who consistently prayed for me and challenged me to think beyond myself. I say all of this to remind myself that the Lord provides, loves, and restores. He created me with black hair, brown eyes, and a small frame. He created me and put me in an Asian household among American neighbors. He planted me in Seattle and watered me slowly, nurturing me through interracial friendships and a church that is becoming more and more diverse. For most of my life I had always believed that ethnic differences were divisive. But I’ve learned that humility, vulnerability, and intentionality regardless of race are the things that break walls of judgment and lies about people. I’ve received such deep love from these brothers and sisters that I want to continue demonstrating the same kind of God-given love to those in the next chapter of my life, whether or not they are Asian or American. 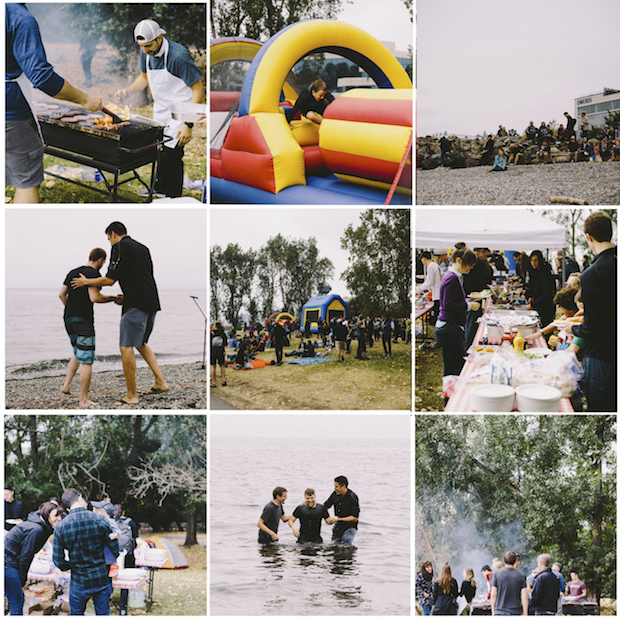 On August 25th, we gathered for our eighth annual BBQ and Baptisms at Myrtle Edwards Park. Through hazy smoke, windy rain, and cooler temperatures, we rejoiced with ten image bearers of God as they shared stories of Jesus’ radical grace in their lives through baptism! What a picture of God’s amazing mercy and handiwork in saving people from varying backgrounds, childhoods, sins, and world views. He is mighty to save and no one is too far out of His reach! Let’s be faithful in praying for more of this life-transforming work in our city, our workplaces, and our spheres of influence!